FREETOWN, SIERRA LEONE (ANS) — Ernest Bai Koroma, elected President of trouble-torn Sierra Leone, West Africa, on September 17, 2007, is a third generation member of The Wesleyan Church, an evangelical, Protestant denomination. A former insurance executive and minority leader in parliament, he has been called the “Hope of the Future” by his countrymen. A graduate of Fourah Bay College, University of Sierra Leone, he taught in a secondary school in Makeni before entering the insurance business. 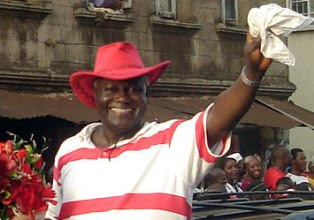 President Koroma and his wife, Sia, are parents of two children, Alice and Dankay. The Wesleyan Church, whose world headquarters is in Fishers, Indiana, has its roots in John Wesley’s Methodism. The denomination has nearly 400,000 constituents in 5,000 churches and missions in 80 countries.